Since I was alone I could hear almost every word of a nearby conversation between two business men during lunch last week. The discussion was typical; sports, something about an upcoming board of directors meeting and favorite travel destinations. While I tried not to eavesdrop I did notice a subtle back lighting effect created by the bright sunlight reflecting off the stone buildings across the street. I sketched the scene as discreetly as possible; it reminded me of an Edward Hopper painting. 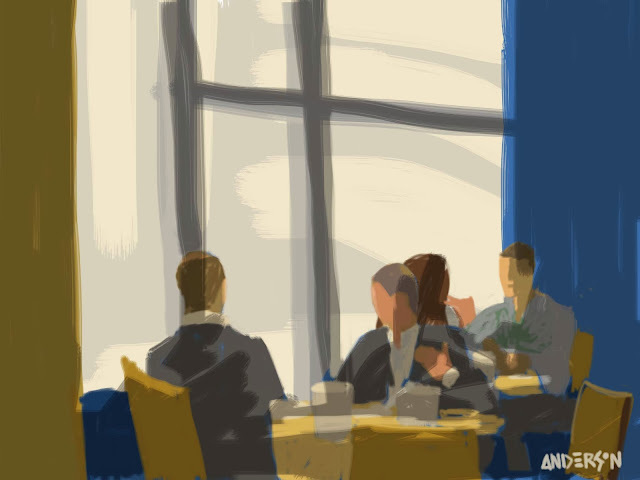 The Luncheon, November 23, 2013; Michael Anderson, Brushes 3 for iPhone, Sensu Brush. That's a beautiful sketch Michael. Very suave and classy drawing! Looks like something out of Madmen!